The image was taken by the Hubble Space Telescope and covers a portion of the southern field of the Great Observatories Origins Deep Survey (GOODS). This is a large galaxy census, a deep-sky study by several observatories to trace the formation and evolution of galaxies. Then, the researchers incorporated new mathematical models to calculate where other galaxies that have not yet been imaged by a telescope might exist. For the numbers to add up, the universe needs at least 10 times more galaxies than those already known to exist. But these unknown galaxies are likely either too faint or too far away to be seen with today's telescopes. Looking far out into deep space also means looking back in time, because light takes a long time to travel across cosmic distances. During the study, Conselice and his team looked at parts of the universe up to 13 billion light-years away. Looking this far allowed the researchers to see partial snapshots of the evolution of the universe since 13 billion years ago, or less than 100 million years after the Big Bang. They discovered that the early universe contained even more galaxies than it does today. 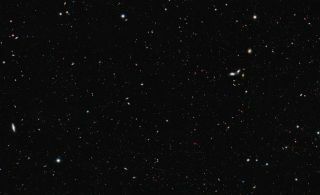 Those distant galaxies were small and faint dwarf galaxies, they found. As the universe evolves, such galaxies merge together to form larger galaxies. In a separate statement, Conselice said that the results are "very surprising as we know that, over the 13.7 billion years of cosmic evolution since the Big Bang, galaxies have been growing through star formation and mergers with other galaxies. Finding more galaxies in the past implies that significant evolution must have occurred to reduce their number through extensive merging of systems." The results of the study are detailed in The Astrophysical Journal.